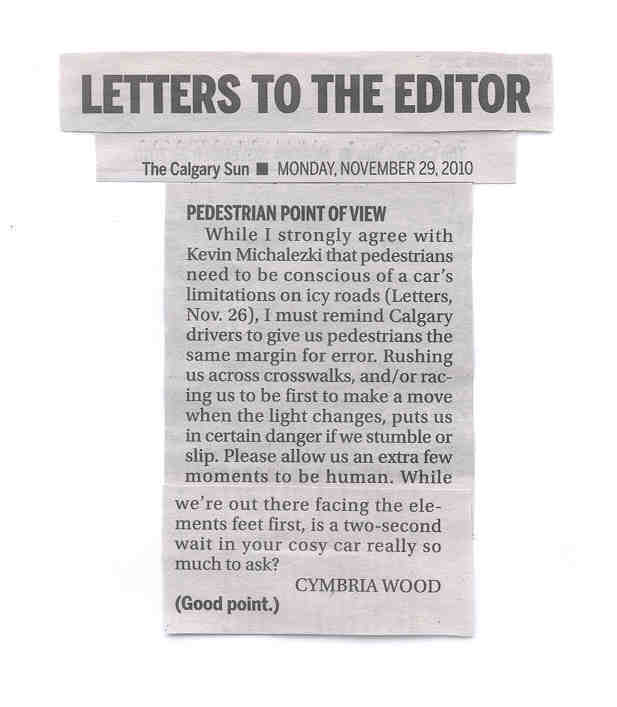 When I strolled into the office yesterday morning, squint-eyed and growling, I found my letter to the editor (a retort written at high-noon last Friday) beaming up at me from the Comments page. Needless to say, my Monday grumblings quickly switched to a very un-Eastwood squeal of glee. Now all of Calgary could see who fired the winning shot! But then just this morning, I was revved at rudely to hurry up when I still had the light, by a greasy (apparently illiterate) maniac in a beige 90’s Toyota who didn’t want to wait his turn. I didn’t have a six-shooter, a lasso, or even a pen, but, dear readers, I did wave my non-fat-french-vanilla-yogurt-cup at him most menacingly indeed. This entry was posted on Tuesday, November 30th, 2010 at 10:36 am and is filed under Writing. You can follow any responses to this entry through the RSS 2.0 feed. You can leave a response, or trackback from your own site. Here’s to hoping… sigh. That fellow’s just lucky I hadn’t taken the lid off yet lol.